The 2012 $5 Star-Spangled Banner Commemorative Uncirculated Gold Coin is one of two gold coins issued by the United States Mint in 2012 to commemorate the bicentennial of the writing of the national anthem of the United States. Also issued by the US Mint was a coin with identical imagery but featuring a proof finish. These coins, along with associated proof and uncirculated silver dollars, were authorized by Congress under the Star-Spangled Banner Commemorative Coin Act (Public Law 111-232). The strikes acknowledge also mark two hundred years since the War of 1812 – a part of which was the Battle of Baltimore. It was during this battle that Francis Scott-Key penned the words to what would become the Star-Spangled Banner. The US Mint was required by law to collect $35 per gold coin sold with those surcharges forwarded to the Maryland War of 1812 Bicentennial Commission. These surcharges will help support bicentennial related activities as well as be used towards preserving War of 1812 sites. Total mintage for the coins is set at a maximum of 100,000 $5 gold coins and 500,000 silver dollars. Star-Spangled Banner Gold Coins are struck from 90% gold to the diameter of 0.850 inches with a weight of 8.359 grams. These are the same specifications used for all modern commemorative gold coins. 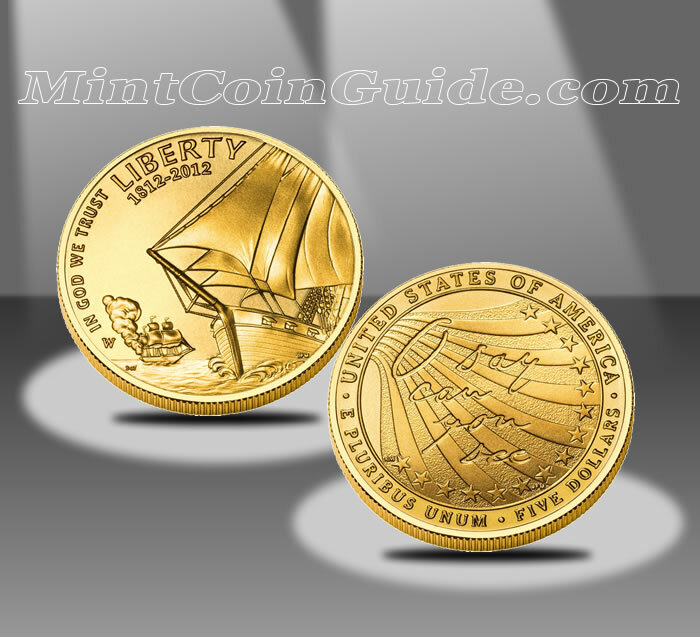 The US Mint released the Star-Spangled Banner Uncirculated Gold Coin on March 5, 2012. 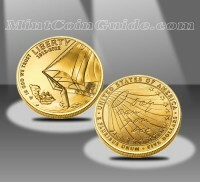 The US Mint initially charged $519.30 for the uncirculated gold coins which reflected a $5 introductory price discount. Like other gold numismatic releases of the Mint, prices were subject to change weekly based on market conditions. The US Mint struck these coins at its facility in West Point. Each coin in the Star-Spangled Banner series was required to be "emblematic of the War of 1812 and particularly the Battle for Baltimore that formed the basis for the Star-Spangled Banner." The obverse (heads side) design of the 2012 Star-Spangled Banner Commemorative Gold $5 Coin is emblematic of the theme “The Battles at Sea During the War of 1812.” It depicts a naval battle scene from the War of 1812, with an American sailing ship in the foreground and a damaged and fleeing British ship in the background. Inscriptions are IN GOD WE TRUST, LIBERTY and 1812 – 2012. The obverse was designed by United States Mint Artistic Infusion Program (AIP) Master Designer Donna Weaver and sculpted by United States Mint Sculptor-Engraver Joseph Menna. The reverse (tails side) design is emblematic of the theme “The Star-Spangled Banner” (the song). It depicts the first words of the national anthem, O say can you see, in Francis Scott Key’s handwriting against a backdrop of 15 stars and 15 stripes, representing the Star-Spangled Banner flag. Additional inscriptions are UNITED STATES OF AMERICA, E PLURIBUS UNUM and FIVE DOLLARS. The reverse was designed by AIP Master Designer Richard Masters and sculpted by Mr. Menna.